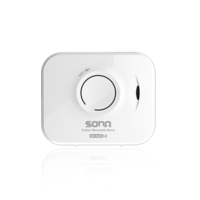 The Sona rnage consists of four products which give complete protection from fire and carbon monoxide. Smoke Alarm - Incorporating Thermoptek sensing technology, as used by UK fire & rescue services. Fast detection of both fast flaming and slow smouldering fires in one alarm. Heat Alarm - The ground breaking Class A1 heat alarm with Thermistek sensing technology, provides a faster warning of fire. Carbon Monoxide Alarm - 10 year, sealed for life battery with Wi-Safe 2 intelligent communication as standard. Our most advanced carbon monoxide (CO) alarm to date. Alarm Control Unit (Test - Silence - Locate - Memory) - The easiest way to control and manage your network of alarms. 10 year battery for life and Wi-Safe 2 intelligent communication. Sona have developed the most technically advanced products that are easy to specify, easy to fit and easy to maintain. 10 Year sealed for life battery back-up. Optional wireless link (Model WSM-SN-1). Year sealed for life battery back-up. Optional wireless link (Model WHM-SN-1). Battery powered alarm control unit for Sona range. Test, Silence, Locate & Memory functions.